Merwin Foard is currently on Broadway starring in MAMMA MIA. He recently appeared in THE ADDAMS FAMILY and THE LITTLE MERMAID. 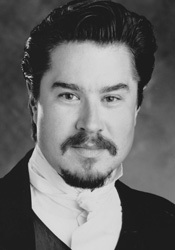 Merwin previously starred as Fred Graham/Petruchio in the revival of KISS ME KATE. He appeared on Broadway as the indefatigable Richard Henry Lee in the hit revival of 1776. Broadway audiences are also familiar with his powerful portrayal of Inspector Javert in LES MISERABLES, as well as Gaston in BEAUTY AND THE BEAST. He has also been seen as Bishop in the earlier revival of MAME. In Toronto, Mr. Foard has starred as Gaston in BEAUTY AND THE BEAST, and Inspector Javert in LES MISERABLES. National Tour credits include Lancelot in CAMELOT, and the role of Raoul in Ken Hill's THE PHANTOM OF THE OPERA. Regionally, Merwin has assayed such leading men as Maximillian in CANDIDE at Arena Stage; Carl-Magnus in A LITTLE NIGHT MUSIC at Pennsylvania Centre Stage; El Gallo in THE FANTASTICKS; as Curly in OKLAHOMA! at both Opera Omaha and Minnesota Opera; and at Ford's Theatre as Russell Higby in ELMER GANTRY. On television, Merwin has appeared on MIDNIGHT CALLER. On video, his voice can be heard on five of Disney's Animated Classics, including the Award-winning BEAUTY AND THE BEAST, ALADDIN AND THE KING OF THIEVES, HUNCHBACK OF NOTRE DAME, LEGEND OF MULAN, and POCAHONTAS.